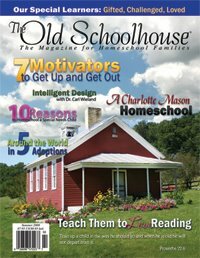 Until midnight on Tuesday, May 26th, you can subscribe to The Old Schoolhouse Magazine ™ for only $15. Plus, as a bonus, you can select 5 FREE WeE-books of YOUR CHOICE! TOS is taking $10 off for one-year print subscriptions! (U.S. only). Use coupon code "FREEPICK5" when checking out. For more details, click through for a 1 year subscription. Also, there are less than 5 days left to RENEW your subscription to the Old Schoolhouse ™ Magazine and get 2 years for the price of 1! For just $25 you'll receive 2 full years of TOS! But you must subscribe by June 2nd to get the summer issue! Use coupon code "2YRRENEWAL"~ that's $3.12 an issue. You can find more details here. Thanks for the info! Just signed up!